This is the best Godzilla vs. Cthulu poster you will ever see. 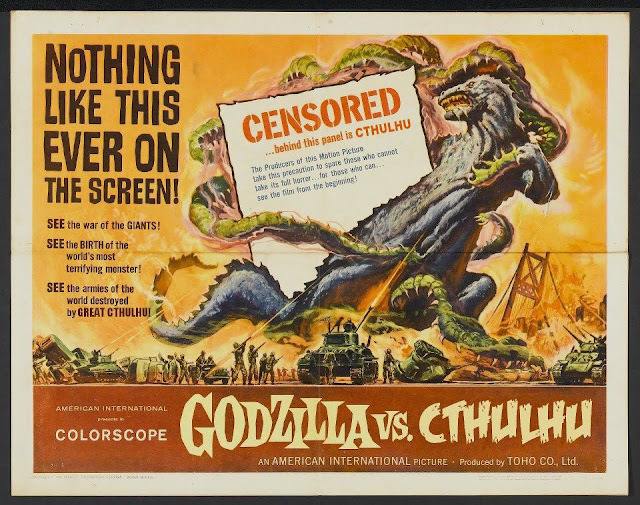 That's not an idle boast either because Godzilla vs. Cthulhu images are more common than you'd think. what is the provenance of this poster? I mean it's a fantastic painting and the designer really looked at old posters to get the look and feel. That was originally the poster for the US release of Godzilla vs. Mothra (aka: Godzilla vs. the Thing). I really only removed mentions of "The Thing". The rest is pretty much how it looked. No hint of there being a giant moth. Wow You have a great Blog...I Will Post A "shout-out" on this place.. Dr. Theda. This is so cool! Godzilla and Cthulhu! Why they don't think about it sooner!